← Chocolate Eclairs are Scrumpcious!! Castor oil & jojoba shampoo bars. Ya gotta try this! I have always purchased shampoo from the store. I’ve tried shampoos made by a wide variety of companies over the years, with all kinds of attributes. Some I bought repeatedly, others not so much. Most liquid shampoos I’ve used require a conditioner as well unless I want my hair to look like a lion’s mane and feel like steel wool. I have baby fine hair and finding a conditioner that worked but didn’t leave my hair limp and flat has always been an issue. 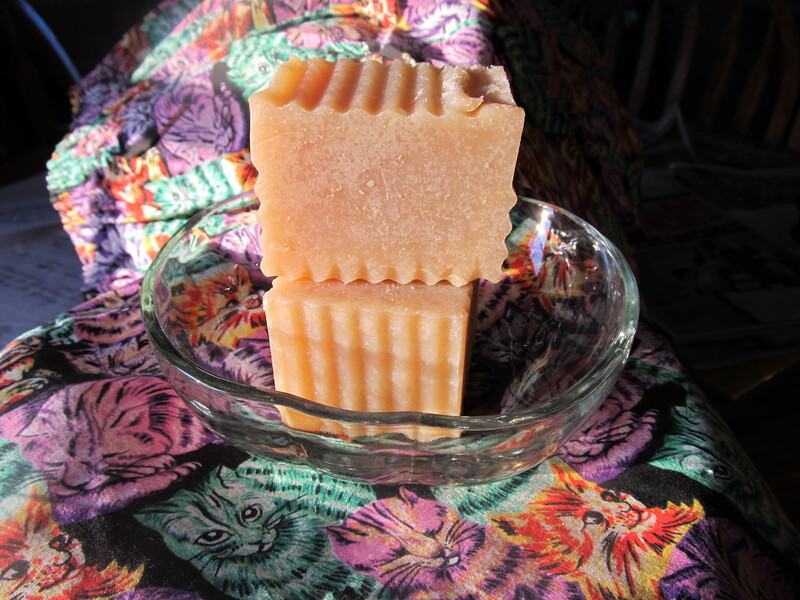 Last year I came across a recipe for a shampoo bar using natural oils. Several months passed before I felt compelled to make a batch. I admit I have used body bar soap on my hair when facing a personal grooming crisis, (out of liquid shampoo), but in general, the results were less than wonderful. Granted, I was using body soap not hair shampoo so I should not have expected miracles, but I was left with a feeling of disdain at the thought of using a bar to wash my hair. I continually look for ways to become increasingly self-sufficient, save money, or incorporate the use of natural products to achieve cutting ties with commercially-made chemical-laden products. Curiosity overcame disdain and I made a batch of the bar shampoo. (The recipe is located in the archives if you are interested). I purchased castor oil & jojoba and anxiously endured the cure time. Castor oil is certainly not something I ever want to take internally again, but its thick viscosity intrigued me as a shampoo. As it turns out, castor oil makes a great shampoo! It does not over suds, but produces a rich emollient lather. It cleans thoroughly, yet gently, and does not strip the oil out of the hair shaft. It also creates more body in my baby fine locks than any other product I have ever used. My hair is thick and strong and feels incredibly healthy, and the best thing is I get all this without using a conditioner. Bar soap is easy to use; just wet the hair and rub the bar over the scalp. Massage with finger-tips and rinse. One shampooing does the trick for me. Its quick and easy to give my hair the “spa” treatment at home. I did purchase a separate soap holder for the shower so I would not get the olive oil/goat milk body and face soap mixed up with the shampoo bar because they are similar in appearance. An additional benefit of shampoo bars is they are perfect for traveling. No more worrying about the size of my liquid shampoo bottle and preventing or containing spills. Simplify, simplify, simplify! This is the key to a happy life! This entry was posted in gift ideas, Life's Simple Pleasures, Recipe, Uncategorized and tagged castor oil, gentle cleaning, jojoba, lather, shampoo bar. Bookmark the permalink. I will post them very soon! Maybe tonight if I don’t fall asleep first…..
Are you selling the shampoo bar? It looks wonderful. Yes I am. I will post to the Etsy shop very soon. I absolutely love your blog and find nearly all of your post’s to be what precisely I’m looking for. Do you offer guest writers to write content for yourself? I wouldn’t mind composing a post or elaborating on a lot of the subjects you write with regards to here. Again, awesome site! Have you ever considered about adding a little bit more than just your articles? I mean, what you say is important and all. Nevertheless imagine if you added some great photos or video clips to give your posts more, “pop”! Your content is excellent but with pics and clips, this website could undeniably be one of the best in its field. Awesome blog!